I think we can never go wrong with some Friday wisdom. 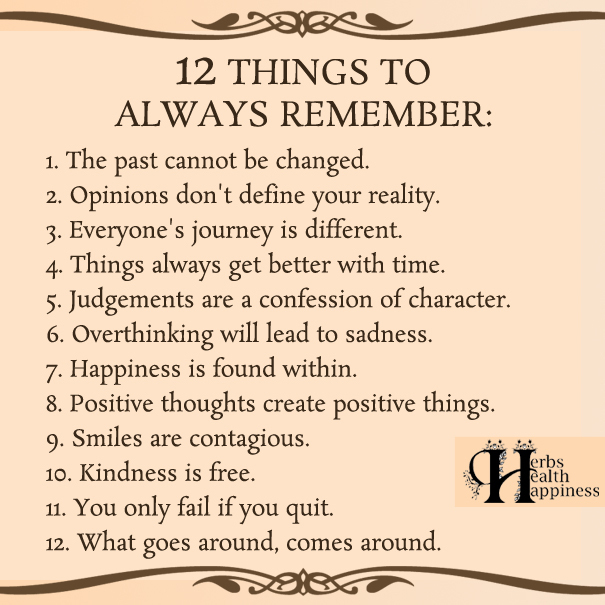 I have decided to post these 12 things in my office and thought I would share. Which one do you connect with most? Which one should you remember most? You know which one speaks to you. We all know these things but as simple as they may be, at times we seem to forget – especially when we are stressed, frustrated or anxious. Stress has the ability to bring out a completely different side in us. Some people become aggressive, others shut down. This overwhelmed stage can lead to brain freeze and it can get to the level when we can’t think straight anymore. No matter how bad it is, tomorrow is another day. Save these 12 insights on your phone or on your desktop so that you have something positive to focus on when things get out of control. It can be truly important to spend a few minutes in order to remind yourself what really matters in life – your Happiness, your Health and your Well-Being.